The Volkswagen scandal (aka #dieselgate), where the VW motor group was caught cheating pollution emissions tests in the US, has been rumbling on for some time now. The media are having a field day, drivers are starting to believe they should receive compensation. The one issue which has not been fully addressed is who has really been harmed? Mostly the scandal is being portrayed by the media as a “consumer rights” issue, there is some talk about protection of the environment, although if most car buyers really cared about “the environment”, they would have bought an electric car or a hybrid. Some people have written to the papers to say as much, fully admitting that for most drivers “the environment” is low on their list of priorities and that cheap motoring is far more important to them. Very little is being said in the media about the impact of air pollution on human health caused by motor vehicles – this is the real scandal. We know that air pollution is a serious issue, that is why there are Air Quality Standards (in the EU and around the world) which are (supposed to be) legally enforceable. Air pollution is an invisible killer, you can’t see it, you can’t smell or taste most of the cocktail of pollutants, but it is killing us. In much of Europe urban air is not fit to breathe, the major cause of this is motor vehicles, especially diesel cars. Although petrol cars are not as harmless as some in the media and the motoring lobby would have us believe, 22% of modern petrol cars fail to achieve emission limits on the road. Furthermore, particle emissions from new petrol engines (gasoline direct injection or GDI) are higher than from equivalent diesel vehicles. The true scandal is that across the EU there are 500,000 premature deaths every year, also 250,000 hospital admissions which, in addition to the human costs and suffering, also cost the economy 100,000,000 lost working days. This all adds up to over €940,000,000 (£665m) in lost productivity per year. These are the real scandals! All this is happening despite the fact that EURO 6 regulations require cars to be tested under “normal driving conditions” – these rules were introduced in 2007. As yet, the regulators are not using portable emission monitoring systems (PEMS) to measure the actual pollution from vehicle exhausts in real-world driving emission (RDE) tests. Why not? Could it have anything to do with the fact that the supposedly independent testing bodies get up to 70% of their funding from the motor industry? Or is it because of the direct power of the motoring lobby? Either way, our democracy (and our health) is directly threatened by such lobbying, not just at the EU level – Westminster is, if anything, more corrupt than Brussels. For too long European car makers have been ducking the EU’s rules to enable them to keep their highly polluting cars on the road. The huge scandal with Volkswagen on car pollution rules must focus the minds of EU politicians and the British government. Air pollution kills tens of thousands in the UK every year. With the added unchecked emissions from Volkswagen cars, I worry about how much worse the situation actually is. We need a truly independent European type approval authority, this should be funded by a levy on each new vehicle sold, paid for by the manufacturers with robust regulation to ensure independent testing. This should also be backed up with strict annual testing of vehicles, to ensure they continue to meet acceptable pollution limits. The current MOT test is not fit for purpose and needs to be brought up to date, with heavy penalties for both tester and motorist, if they are caught trying to cheat the system. It is a matter of urgency for the European Commission to bring forward proposals for Euro 7 emissions limits so that the limits for diesel, petrol and natural gas vehicles are all the same, and also to ensure WHO health limits are met throughout Europe. Closer to home, we need make all our built-up areas low emission zones. We cannot choose where we breathe, so we must stop vehicles polluting our air. The technology to clean up vehicle exhausts is available and costs little. It is a small price to pay compared to the nearly €1 trillion (£1.36 billion) spent annually on health care and lost productivity. Vehicles with engines, running on whichever fuel, must be stopped from polluting our air or prevented from accessing our towns and cities. We should ALL have the right to clean air wherever we are as we ALL need to breathe. Don’t just take my word of it, here is Dr Ian Mudway at Routes to Clean Air, Health Effects of Air Pollution. Are cyclists at greater risk from air pollution? What’s the story with Nitrogen? 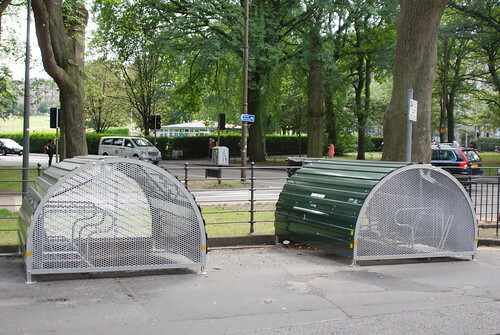 Just over five years ago (in September 2009) I wrote a blog post “Cycle parking, please can we have more…” in which I talked about the problems with lack of secure bicycle parking in Edinburgh. I flagged up issues the particular problems for tenement dwellers in Edinburgh, where storage is often a very real problem (as it is across most Scottish cities), added to which people living in tenement areas are less likely to own a car. Three years ago things were looking positive as there where the first glimmerings of hope that something might actually be happening. 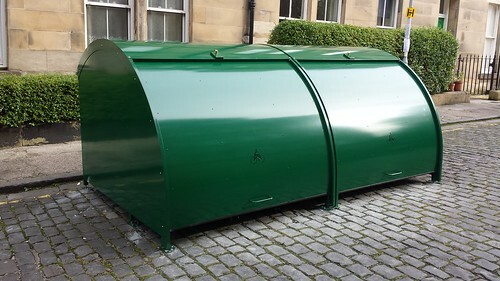 There had been an announcement that City of Edinburgh Council (CEC) has proposed a Pilot of on-street residential cycle parking. I was one of the first to put in an application and waited with bated breath, well almost. As the closing date for application was December 2011, it seemed reasonable to expect that here might be something on the ground by the summer of 2012. In early May a letter arrived inviting all those who had applied to be a part of the trial parking project to a site meeting to consult on how it might work in practice. So it was that my self and one of my neighbours met with a number of officials, including the CEC’s cycling officer (Chris Brace), a CEC Project Engineer (Scott Mannion), one of the environmental manager (David Doig) and LBP Crime Prevention Officer (Carol Menzies). We had a wide ranging discussion, as we stood in the spring sun shine, covering all aspects of how that cycle parking (and its location) could affect the street, from accessibility to security, from refuse collection to turning space, and more. The meeting ended with a general consensus that the best location for the cycle storage was at the southern end of the street on the west side, on an area of concrete pavement which is currently just dead ground. It felt like something was really about to happen after two years of campaigning and lobbying, finally we were getting what was needed. For a couple of months nothing happened, no information, nothing. In late July 2012 a letter arrived saying that the council was going to hold a written consultation for all residents in the street. A number of my neighbours came to ask me about this as they wanted to know more about the proposal, everyone I knew who lived in the street was in favour of the idea of having a secure cycle parking facility (even those who owned cars and those who didn’t own a bicycle). The written consultation was than followed with a series door to door interviews, and it was beginning to feel like someone at the Council was doing all they could to find an objector, so that they could stop the scheme (maybe I am being too cynical here). Following all this consultation things went quite again until late June 2013 when another written consultation arrived, this time with plans showing the proposed location of the cycle storage on the opposite side of the street from that which residents said they wanted in the earlier consultation. I am told that there eleven responses to this consultation, all in favour of having the cycle storage on street and three saying explicitly that it should be on the far side of the street (the other made no comment on the location). One wonders why it is felt necessary to have quite to much “consultation” when they don’t bother to take notice of what the people who are going to live with the infrastructure actually have to say. It strikes me that a large amount of public money is wasted in this way. Move forward to June 2014 and the City Council break their radio silence again with a letter to say that three different types of secure on street cycle storage across five locations across the city. 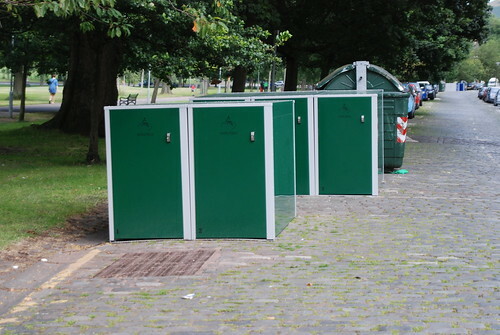 The three types of storage chosen were the Cyclehoop Fietshangar, Cycle-Works Velo-Box lockers and Cycle-Works Streetstores (the latter a somewhat experimental design to judge by their website where there are several different prototype designs shown). The letter went on to say that the installation would be completed by the end of July 2014. By this time I was starting to feel I would only believe when I saw it, so you can imagine my surprise and delight when I was told of shiny new Cyclehoop Fietshangars had been sighted in the city! 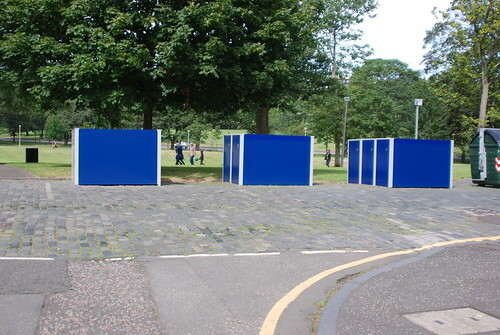 Then came the news that Cycle-Works Velo-Safe lockers had also been sighted. This was real progress at last! But wait where were the Cycle-Works Streetstores? There was no sign of them anywhere and again silence from the City Council, after some prompting there was a few vague comments that they were coming soon. July turned to August, the Festival came and went, September, still nothing, then finally in October Streetstores were sighted for the first time! How does the scheme actually work? Now there’s a question I keep getting asked, well, places in the cycle storage is offered to first to residents living within 100m of the stores. Only two places per flat are allowed per flat (which is rather unfair on students living in Houses in Multiple Occupation or HMOs) and place are allocated on a first come first serve basis. Each person gets a gets an individual contract and must give the details of the bicycle they are intending to store. The contract also states that the storage can only be used to store “a security-tagged bicycle belonging to or in the care of the member”, later in the contract it talks of bicycles with a permit and displaying a permit sticker. As to costs and pricing, the contract states that “during the period of the Scheme the Council will not make a charge for participation in the Scheme. The Council may bring the pilot Scheme to an end on giving 14 days’ notice to the Members, and thereafter charge the Member for continued participation in a new scheme and take a deposit for the access key”. Nowhere, in the contract does it give any indication of how long the pilot Scheme will run for, nor is there any mention of how much the charge might be in the future. Elsewhere, it has been stated that the “cycle parking would be … trialled for around 2 years“. Also “It is expected that there would be a charge of around £5 per month per user for the use of the covered storage options to help cover running costs”. This would mean that it would cost £60 a year to park a bicycle compared with £31.50 to park low emission car in the same permit zone. When you bear in mind that ten bicycles can be accommodated in the space required for one car, this seems rather excessive, no doubt the Council will say that this reflects cost of maintaining the cycle storage, whilst blithe ignoring the costs involved in controlling car parking in the city. If the council are to introduce such a high charge for cycle parking, then it would only be reasonable that all subsidies for car parking be dropped and that the cost of car parking be brought up to a matching level. I have been using the bicycle as an everyday means of travel for about 20 years now, and have done a fair bit of short touring. So when I saw this wee film I just felt the need to share it. Enjoy! So why aren’t we doing more to encourage cycling in Scotland? It’s one of the fundamental duties of any government to protect the lives of its citizens. However, here in Scotland, both national and local government drag their feet on these issues. I have sat across the table from the Scottish transport minister and asked him to use the powers which have been devolved to the Scottish Government, to lower the national speed limit in built up areas (defined as places where the street lighting columns are < 185 m apart) from the current limit of 30 mph to 20 mph. This is would at a stroke save lives. However, he has refused point blank to do so, saying that it would take away powers from Local Authorities (LAs). This argument is utter nonsense as LAs have the power to raise or lower speed limits on individual roads as they see fit. So the real effect on LAs would be that they would have to justify to the voters why they wanted to raise speed limits in built up areas, where people live, work and shop, from 20 mph to 30 mph. It is well known that 20 mph speed limits are popular with people who live next to the roads where these limits apply. Therefore, it may prove difficult for LAs to raise the limits, but that's Democracy for you. Here in Edinburgh, there has recently been an announcement from the City of Edinburgh Council that it intends to lower the 30 mph speed limit to 20 mph, across the whole city, but not until 2017. Why 2017? You may well ask, well for one thing, it is after the next local elections. Also it gives them three years in which to try and find justifications to maintain the higher 30 mph speed limit on “key arterial roads”, even though these pass through some of the most densely populated parts of the city. Why are our elected representatives not acting in the best interests of the people? Why are they not taking simple steps to protect the health and lives of the citizens they are elected to represent? The only answer can be moral cowardice! For this reason I urge you all to join the Pedal on Parliament protest on the 26th April 2014 to send a message to those who have the power to change things – now is the time to grow a spine and show some moral backbone! Onus should be on the cyclists? "If you have everything, gloat. When that gets boring, start your own line of perfumes."